Psych-rock is often a nostalgic genre, firmly rooted in the traditions of decades past. 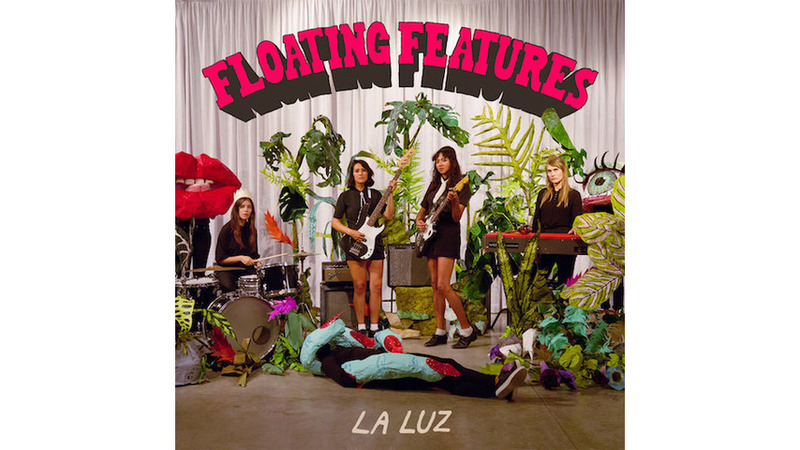 La Luz know this, so their third album, Floating Features, looks both ahead and backwards. On Floating Features, the band take classic psych attributes—dreamy melodies, swirling vocals, surf riffs—and repurpose them to create a collection that is classic, but also current, placing their distinctly modern perspective squarely in the limelight. Floating Features finds La Luz—singer/guitarist Shana Cleveland, drummer Marian Li Pino, keyboardist Alice Sandahl, and bassist Lena Simon—relocating from Seattle to Los Angeles. Now that Hollywood is their home, it’s fitting that Floating Features includes references to movement and travel, and overall, cultivates the vintage feel of a B-movie soundtrack. The album’s title track, a soaring instrumental opener, sets the scene for adventure, and fully embraces 60s kitsch via heavy organ, snappy beats and intricate, knotty riffs. “California Finally” has the impact of a triumphant film climax, our heroines cruising the sunny freeway with wind in their hair. “In the morning, I do what I wanna,” Cleveland croons, a simple-yet-effective declaration of freedom. The Floating Features tale concludes on a more solemn note with the abrupt finale of “Don’t Leave Me on the Earth.” Cleveland sings of juniper, a plant which symbolizes divine protection, before flatly stating, “I don’t wanna die.” It’s the retro album’s most modern moment; anxious and honest, it confronts existential dread in a way that feels fresh and relatable. Despite its many nostalgic elements, Floating Features represents a new start in a new city, and though it often looks inward, it’s grounded in the present and glances towards the future.